WSO2 Governance Registry (WSO2 G-Reg) is a fully open source product for SOA governance. In G-Reg 5.0.0 release, we have introduced a revolutionary enterprise publisher and store for asset management. As I explained in my previous post, the Lifecycle of an asset is one of the critical requirements of enterprise asset management. With WSO2 Governance Registry 5.3.0, we have introduced a new Lifecycle management feature for publisher application as well. 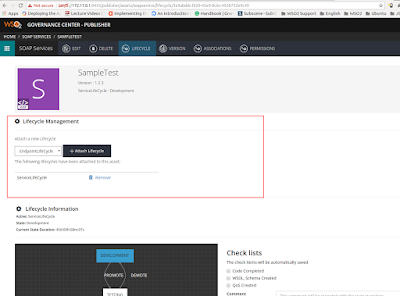 After enabling lifecycle management in the publisher, you will be able to see new lifecycle management UI as below.